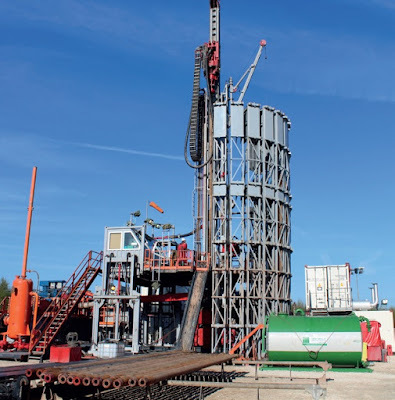 A judge has sided with oil and gas exploration and production business, INEOS, and dismissed a legal case to overturn a planning inspector's decision to approve proposals for a test drilling well in Rotherham. The community group Harthill Against Fracking (HAF) brought the challenge against the Secretary of State for Housing, Communities and Local Government over a decision of the Planning Inspectorate last year. The case relates to INEOS submitting an updated travel plan before the public inquiry where it was successful in obtaining planning permission. Rotherham Council had initially set out its stance that it would refuse the plans on transport and ecology grounds. The application provides temporary permission for a maximum of five years and the operation will involve various site investigation surveys and site preparation before a period of drilling, coring and testing. A well is set to be drilled to approximately 2,800 m using a drill rig of maximum 60 m rig height followed by three months of testing. Mrs Justice Andrews DBE heard both sides of the claim that whether, in refusing the request from HAF to adjourn the planning inquiry so that they could consider new highways material, the planning inspector acted in breach of the rules of natural justice. The case, heard in Leeds at the start of the year, showed that HAF relied on the Council to make the running in terms of opposing the appeal and calling expert evidence in opposition to INEOS on the two grounds of refusal. Rotherham Council complained to the Planning Inspectorate that it had insufficient time to read, digest and respond to the new report from consultants AECOM, before it had to serve its own evidence. INEOS argued that, although the AECOM report was 140 pages long, there were only nine pages of operative text describing the changes in the enhanced traffic management plan. The authority's transport planner went on to state that the updated plan provided mitigation to his earlier concerns and reasons for refusal. The Council's planning board did not agree and the Council's position on the appeal remained one of opposition to the grant of planning permission on grounds of highway safety. The Inspector ruled that the AECOM report should be accepted in evidence without an adjournment. INEOS representatives would answer questions on the report on day one before representations in the second week of the inquiry, in order to giver interested parties further time. Solicitors for HAF argued that the timings and the decisions taken by the planning inspector were unfair. The judge concluded: "The Inspector's refusal to adjourn the Inquiry and the reasonable and proportionate measures he adopted instead to cater for the position of interested parties, including the claimant, did not deprive the claimant of a reasonable opportunity to challenge INEOS's case and put his and HAF's opposing case on the appeal. There was no procedural unfairness, and there was no material prejudice. This statutory challenge must therefore be dismissed."